I’ve said it before and I’ll say it again: I like Mondays. I know I’m in the minority here, but the way I see it, Mondays are full of possibility – like morning, and the first day of every month, and the first day of school and the first day of the year. Monday begins a new week and the door is wide open for something good to happen. It could be anything! And this Monday I’m feeling particularly happy because of you. At the end of last week I got not one, not two, but THREE Versatile Blogger Awards AND I got tagged. In addition, someone commented that she looked forward to reading my blog. My Blog. MINE! I can’t believe it 🙂 I am honored and touched. So first, let me acknowledge the awesome bloggers who awarded me. Thank you all so much! Please take a moment to check out their wonderful blogs! And, let me also acknowledge Grillyfish who tagged me – check her out too! Now, let me just say that I’m really terrible at these awards. I’m so grateful to the people who felt I was worthy of receiving them, but I can never choose who to forward them to. I treasure everyone who reads and comments on my blog and I don’t feel right singling out only a few to pass the award on to when you are all so wonderful. So I’m going to combine the awards and the tag I received by telling you 10 random things about me (because the conditions are 7 for one and 10 for the other) which you may or may not care to read 🙂 and then I am going to give you ALL a present!!! 1. My favorite color is blue – not pale blue, but pretty much any other shade from periwinkle to royal to midnight. Second favorite is a tie between pink and yellow. 3. I think roses are pretty, but I don’t like the way they smell (except for the delicate little wild roses.) I love carnations, which have a kind of light spicy scent, and lantana, which smells citrusy. 5. I think it’s entirely possible I may have been a cat in a previous life (or that I will be one in my next life.) I base this on the fact that I love to sit in warm sunny places or very close to the fire (as mentioned in #4) and I do not like to swim! 6. I have jumped horses up banks, through brush, over ditches, and into water. (I spent my young adulthood being a competitive Three-Day Event rider.) I am one of those horse-crazy girls who never outgrew the phase. 8. My all-time favorite candy bar is Snickers. I challenge you to come up with anything better! 9. When I was 8, I stole a pack of lifesavers from the stationary store on the corner, but I felt so guilty I turned around before I’d gone half a block and went and put them back. So there you are. 10 random things. Feel free to share your own! Now. The moment you’ve all been waiting for! Are you ready? Here is your present!!!!! Ooh! Ahh! Ain’t it purty? Now, here’s the deal. This present contains whatever you’d most like to have today! So go ahead! Open your present! And then tell me what’s inside! Whoever has the best answer (to be determined, very scientifically, by writing each one on a piece of paper, mixing them up and drawing one, or else, possibly, very subjectively by me) will win their choice of a signed copy of any one of my books they choose, or a $10 Amazon gift card. Would You Read It Wednesday – The Eighth Pitch! Thanks for introducing me to some new and interesting blogs. For my present, I'd like some great new plot ideas to get me past a problem I've been having with my writing…so I think I'll go and work on those now! This is a brilliant idea. What fun! First of all congrats on those awards. I know how you feel about dishing them out. I've had a go and found it painful. Please don't put yourself down!! Your 10 random things are fascinating. In fact, reading your one about being able to sneeze in any language must surely give one of us an idea for a story! I may go and write it out now. Finally, thank you for that present and yes it does look lovely. I'd love to open it up and find a year (or more if I dare to ask) of health for my dear family… and for myself so that I can enjoy them. This last year has been tough. Thank you for the present! It is so pretty that I didn't want to unwrap it. But I am glad that I did. It is a clean counter top in the kitchen! Thank you for the motivation and smiles on this rainy day! Hi Susanna, My present was going to your site from LinkedIn and reading your sunny blog post and getting anything I want. You cheered me right up. The info on LinkedIn was so self serving that I was getting down. 🙂 Now it's yah! *sparkles and sprinkles*. Thanks. I think I'll go write now. My fav thing to do. And congrats on all the awards. You do have a fun blog! Clar – now you have just given me a present, saying such nice things 🙂 Thank you so much, and I'm so glad my blog makes you feel sparkly and sprinkly 🙂 hope the writing went well!!! Congrats on your blog awards!! you really do deserve it! 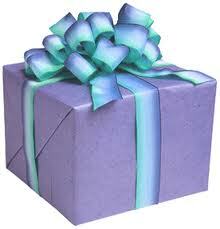 I LOVE the present idea, and my favorite color is also blue. Always has been! I love reading your blog and your sense of humor. Mondays are a new beginning- I love your perspective. For my present, it would be taking the time to just sit on the couch with a book on a rainy day. It's been a long time and now I can't wait for the next rainy day! Seriously, I don't want to give the job away, but I just want reassurance that it will all get done on time!! But what was ACTUALLY in the box was that the clouds went away and the sun came out, and I did a few pleasant errands and then came home and watched some TV, something I haven't really sat and done much in four years. But I just had to see how Ashton Kutcher did on Two and a Half Men. Congratulations on being nominated three times – proof that you deserve it. I know what you mean about making the difficult decisions on singling people out. That's why I'll need to add more links to other great blogs later. I do so agree about passing the awards on and I LOVE your solution. So, have horses appeared in your books, yet? I too have a penchant for sitting perilously close to open fires! My present is a serendipitous encounter with a stranger…. I love that feeling of sensing that an encounter was just meant to be. Elizabethanne, Ms. Saba, A2Z Mommy, Kelly, Joanna and Debbie – thanks so much for sharing your presents and for all your nice words about the blog! Really, I thought this idea up on the spur of the moment. I had no idea how much fun it would be! When I woke up this morning to an inbox full of people's ideas for presents, it was like I was opening a pile of presents myself! Thank you all for joining in the fun!!! Joanna – I have written books about horses and with horses in them, but none are published yet… one in particular I had such high hopes for, but have been told it's too quiet… Have to work on that! There was a great blog post earlier this week about the importance of “Quiet” books, I'll see if I can find it. I got the one hour to read with a cat curled up warmly in my lap, thank you! Now, can you just tell my kitty she is safe to stay in my lap? She will jump up for a minute, then leaves 😦 I sure miss having a lap kitty! I used to 3 day event too and am still horse crazy! – mostly do trail riding now but love it when a tree has fallen across the path and I simply MUST JUMP IT. Joanna – I may have read it… or at least something about quiet books… but I must say, though everyone says how important they are, they are a hard sell!!! Joanna again – I have NOT read that one – thanks! This is the best Monday post EVER! 🙂 I love your horse and dog stories. I'd take my dog with me everywhere too except he is such a maniac I can't! I have had a sore back lately. Mercifully I opened your present and it was a deep tissue massage! Who wouldn't love a Monday, Susanna-style? 🙂 Congratulations on receiving some well-deserved awards, and thank you for the beautiful gift. Inside I found time to enjoy a stroll through the walnut and fruit orchard and enjoy the scents, sights and sounds of early autumn weather and the fall harvest. Julie – I'm so glad you got a well-deserved and much-needed massage! I think I could use one too. Where is my personal masseuse…? Oh how lovely. I actually took all my blog awards off my blog because they were taking so long to do *sssh! * This one is nice though because we've just discovered some new blogging buddies. Thanks for the present, peace and quiet with zero to do for five mins would be heaven. Oh thankyou Susanna, what a lovely present. So beautifully wrapped I didn't have the heart ot open it till now… guess what! It put such a smile on my face that a wonderful idea came to me, you will have to check out my blog around Sunday or Monday to see the great idea you gave me to post. (nah, nah… not telling). Thankyou so much, I love your blog and snicker bars…LOL. Catherine and Diane – your gifts sound lovely! Diane – can't wait to see your idea, and good luck with the critique partner!